马丁. 名堂在线"互联网+"助推教育行业升级[J]. 新华网成都, 2016(4): 20. 何克抗. 从Blending Learning看教育技术理论的新发展[J]. 电化教育研究, 2004(3): 1–6. 袁维新. 科学教学概论:建构主义观点[M]. 徐州: 中国矿业大学出版社, 2007: 32. 郑三元. 人本主义课程论与学前课程决策[J]. 学前教育研究, 1999: 21. 费孝通. 跨文化的"席明纳"[J]. 读书, 1997(10): 3–9. 何玲华, 王哲平. 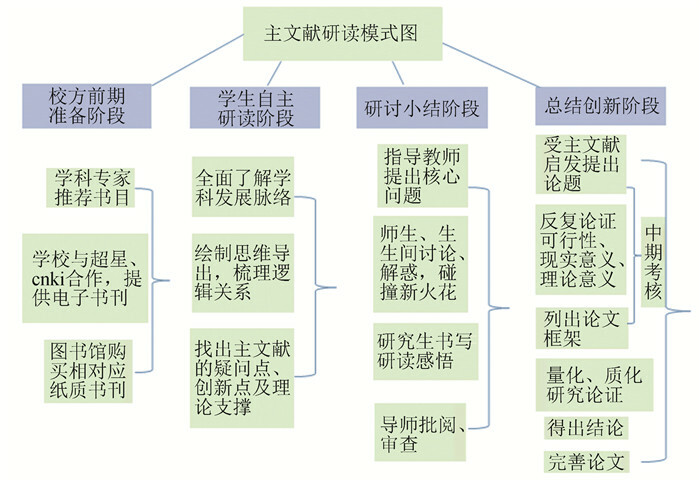 经典原著阅读与研究生创新思维能力的培养[J]. 中国高教研究, 2008(2): 39. Abstract: On account of the current situation in which postgraduates lack self-cultivation in academic accomplishment and are flighty in their study that leads to low education quality, the Southwest University has proposed a main literature studying mechanism for postgraduates on the basis of blended learning. Specifically, the university blends the form and contents of literature, learning style, assessment method and the way of interaction together to assist postgraduates in studying literature during their professional study, so as to improve their academic competency. The authors state in this paper that classic literature study is the basis for the main literature study with the focus on cultivating self-study ability of the postgraduates, and the purpose is to promote self-cultivation in academic accomplishment of the postgraduates and cultivation quality. In conclusion, the authors affirm that the study mechanism and the road map developed thereof has provided a new path for innovative cultivation of postgraduates. The result turns out obviously impressive in the past six years.